Friends of mine would probably never describe me as conservative. I unabashedly call myself a feminist. My headshot for a theater group I was in had me reading Marx. If you let me, I’ll tell you my criticisms of Obama from the left, and hell, my twitter handle is @TheSocialest. Recently, however, I’ve been noticing that when it comes to games, that instead of playing to win, I’ve instead been playing not to lose. Semantically, they’re pretty similar, but in actuality, there is a significant difference in the manner of play. Everyone who plays games with the frequency that I do is going to lose games, but by playing “smart” you can generally avoid big losses and put yourself in a good position to win by the end. Or so I’ve been telling myself. But I’m starting to think that playing not to lose is less about winning and losing and more about avoiding embarrassment. It means playing conservatively, sticking to a strategy I’ve seen work before and one that I know will get me a respectable score, if not the winning score. Its the football equivalent of 4th and 1 and punting even though you’re on the opponent’s 40. Its the type of decision that coaches make to avoid criticism. Its the safe call rather than the best call. And not for nothing, but it goes directly against the way I played in the All Trains Go To Helena game that I’m so proud of. And that may be the true crime in all this and why it merits a post. Its not fun to lose most of the time, and yes, coming in last can be embarrassing, but if you aren’t stretching your brain a little, why are you playing? Its just a game! It is there to be enjoyed! Playing for second is like being the wallflower at a dance party. Sure, getting out there on the dance floor can a little scary, but only by putting yourself out there and taking that risk are you going to have a good time. I hear about looking at the past through rose-colored glasses with movies a lot, but it happens with board games too. It’s a part of why I still love Monopoly. Solarquest, a similar game but in space (not space-themed Monopoly, the rules and board were different), held a lot of my childhood attention, but quickly faded in college when I realized how broken the system is. Some games hold up; I still like Settlers of Catan, and Risk is alright for what it is. 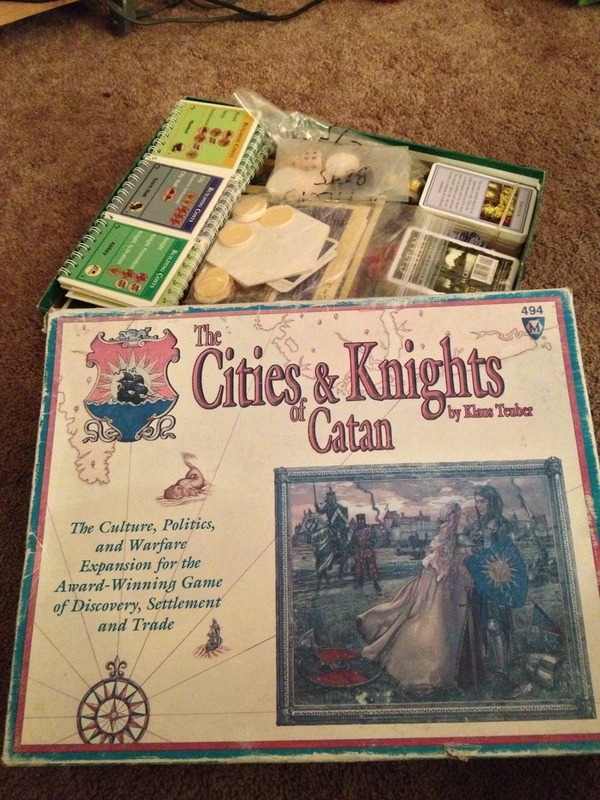 But one game that has not held up so well, as evidenced by a recent play-through with a couple friends, is my previously loved expansion to Settlers; Cities and Knights of Catan. This old tarnished box contains the set of Settlers, Cities & Knights, the 5-6 player expansions, strategy notes, and 13 years of memories. Nearly everyone is familiar with SoC. Not a lot of people have played with expansions. C&K is a nice idea on paper, expanding previously nebulous concepts into larger game mechanics. Specifically, development cards and “largest army” are replaced with progress cards and knights. Cities now produce commodities for certain resources, and those commodities buy city upgrades. These upgrades provide players with a chance to earn progress cards in one of three categories; commercial, scientific, and military. This is where the previous development card powers go; monopoly, road building, year of plenty, etc., are now expanded into a number of different powers, some good, some great, some not so good. They’re earned by using a third die, the “event die,” which shows what type would be produced, and a red d6, which represents what level of that upgrade you need to earn a card. Knights are no longer one-shot cards. You build knights, feed them, and place them on the roads you build. They can block cities, sever longest road chains, displace other knights and oust the robber baron. They also serve to protect the island of Catan; that event die has 3 spots that show a barbarian ship. After 9 total rolls of that, the barbarians show up, with strength equal to the number of total cities on the board (everyone starts with 1). All active knights become inactive, and you compare cities vs. knights. If the knights equal or beat the barbarians, the one who contributed most gets a victory point. If there’s a tie for contribution, those players get a progress card. If the knights aren’t enough, the one who contributed least loses a city, replacing it with a settlement. For ties, everyone who contributed least loses a city. There’s a lot more “player interaction” in the game. By that I mean there are more ways to screw your opponents over. Knights can bounce the robber baron around, and a number of cards take resources, cards, or even knights from other players. The delicate balance of social interaction is negligible here, because everyone generally has what they need, and trading isn’t nearly as useful. The barbarian ship is a rough addition as well. If you’re in a position to get knights, chances are you have a lot. It’s not uncommon then to be in a position where you could activate all your knights and get the static victory point, or just contribute some and let the barbarians destroy somebody else’s city. If you’re lucky you can get multiple cities down, and everyone losing a point and a city is way better than gaining a point that doesn’t do anything. We talked a bit about “tactical bitching” in a previous post. I’ll admit I was in a good position early on, but not so good as I thought I should be targeted. In retrospect, most of my bitching was of a calculated variety. I ran away with the game, which is what usually happens in a C&K game. There are ways to screw your opponents, but it’s generally a “rich get richer” setup to the game. Once I got one of the super-powerful commodity upgrades (produce a resource of your choice when a roll gives you nothing) I probably should have been hit with every card, baron, and trade designed to block my progress. And it would have been miserable. As it is, I got hit with every spy and many theft cards. And it wasn’t enough to stop me, not even close. And I still felt pretty put upon. I think that’s a big part of it. There are a couple other little things I could point to. The Progress cards are imbalanced; some are crazy powerful, some are flat-out useless except for specific situations. The game has many avenues for points, so the game goes to 13, but it’s much more obvious who’s going to win earlier than that. In the end, the overall issue with me is that, where SoC is more often than not a slow-burning, close race throughout the game, C&K is a vicious scramble in a sand pit, with a king of the pile sussed out early, and a number of people getting bulldozed over the course of the game. I think it’s a shame that the C&K expansion isn’t out for the Xbox Live version of the game (it exists on other online sites that use the rules but eschew the licensing issues). But there’s a reason it doesn’t exist in a larger arena, and why there aren’t tournaments for it. The expansion is fairly imbalanced, not quite broken, but in the end it isn’t worth it to lash a bunch of pieces to a simple game. I still think the expansion is neat, but yeah, it’s a lot of components that clog up an otherwise elegant game. The new stuff isn’t balanced, in game power or game pace. The game takes longer, and those extra minutes aren’t filled with a lot of joy. I think it’s going to be a while before this gets pulled out of the box again.